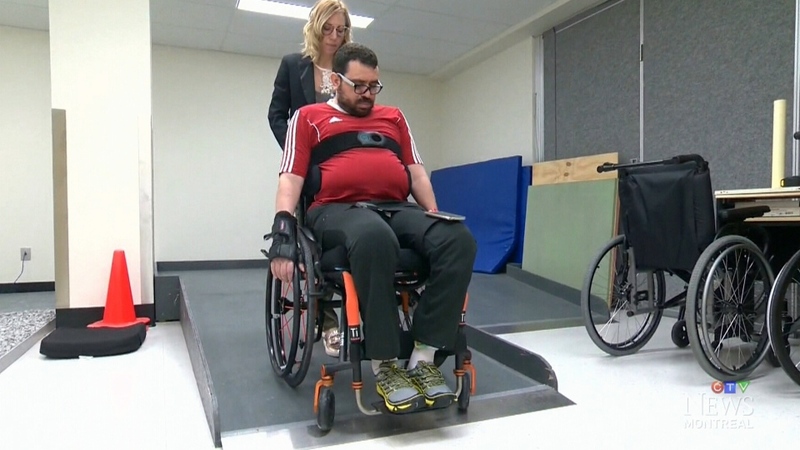 A man who took seven bullets to save others when gunfire erupted at a Quebec City mosque almost a year ago is a paraplegic who struggles to steady his shaky hands. But his faith never wavers. Aymen Derbali, a 41-year-old father of three, now lives in a rehabilitation hospital, working to regain strength and movement in his hands and arms, learning how to navigate the world, and coming to grips with his new limitations. He is relearning how to eat and simply applying the brakes on a manual wheelchair requires exhausting effort. But Derbali succeeds. Mastering physical tasks such as writing or operating his cellphone are very important to him because they will give him some autonomy, he says. Derbali is an IT specialist who holds two MBAs. He has lived in Quebec City since he left his native Tunisia in 2001. He almost didn’t make it to the mosque that day, Jan. 29, 2017. He had lost track of time while setting up a TV for his kids and told his wife he would pray at home. Then he changed his mind, a decision that nearly cost him his life and certainly changed the course of it. Derbali hadn’t been at the Islamic Cultural Centre of Quebec in the suburb of Sainte-Foy very long when the sound of gunshots shattered his quiet ritual. The shooter, a young man, was standing just to his left, he says. About 50 people were in the mosque. Derbali made a decision: to hold his attention so others could run. “If he shot in my direction, he would be losing bullets in the wall. He was shooting a lot in my direction. I think I was injured in my leg the first time and then in my chin, here. I received two bullets,” he said. When the massacre was over, six people were dead and 19 injured. Derbali had been hit in the spinal cord and one bullet nearly pierced his heart. 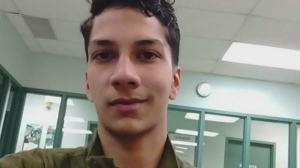 Alexandre Bissonnette, 27, faces six counts of first-degree murder and six counts of attempted murder. His trial is scheduled to begin March 26. Derbali was in a coma for two months, waking to discover he is paralyzed from the waist down. He can’t move back into the fourth-floor apartment he shares with his wife Nedra Zahaouani and sons Ayoub, 9, Youssouf, 5, and daughter Maryem, almost 2, because it’s not accessible. A crowdfunding campaign launched by DawaNet, a Muslim non-profit in Ontario, aims to buy him an accessible home. It had raised about $304,000 of its $400,000 goal by late morning Friday. He’s also received money through Quebec’s victims compensation fund and other donations. “I would like to thank people who have been supporting me,” he said. He’s also appreciative to the doctors who saved him and the healthcare professionals who continue to help him get his life back. Derbali faces a long road ahead. Derbali says he wasn’t meant to die that day in the mosque. He takes wheelchair transit every Friday to pray at the mosque where the shooting happened. Even though he can no longer stand or kneel, and stark reminders of the horror that took place there remain in the bullet holes in the walls and the shoes of the dead men in the shoe rack outside the prayer room, Derbali wants to be there to give thanks. Aymen Derbali was paralyzed in the Quebec City mosque shooting on Jan. 29, 2017.